Stress Less Paint-By-Number Flowers for Mother’s Day: Giveaway Opportunity! Stress Less Paint-By-Number Flowers for Mother’s Day Giveaway Opportunity! The Stress Less Paint-By-Number Flowers kit gives you everything you need to paint your stress away, and create beautiful art in the process! With more than two dozen flower illustrations, you can choose from lilies, zinnias, daisies, sunflowers, bluebells, and more, then follow the color selection instructions and unwind. You don’t have to worry about picking the wrong color, or blending the wrong shade. This carefully curated, soothing palate ensures each piece you complete will be frame ready. Enjoy spring time with Stress Less Paint-By-Number Flowers—you deserve it! We have teamed up for a Giveaway! 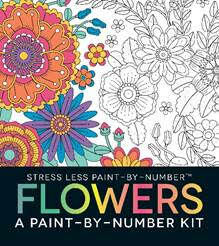 One winner will win the Stress Less Paint-By-Number Flowers Kit! To enter, leave a comment below! Deadline to enter is May 7th at noon PST! U.S. Residents only, please. Self Disclosure: No compensation was received. Info and image were provided and SoCal City Kids will select the winner. One of my favorite things to do is coloring book. i could use this with all the stress i have lately, thanks for the chance! My kids and I are hugs into arts and crafts; my eldest son is on the autism spectrum and finds solace and focus in painting and color pencils. Thanks for the chance! This sounds great! Sometimes it’s hard to choose colors when given an empty picture and not have them clash or have enough contrast.